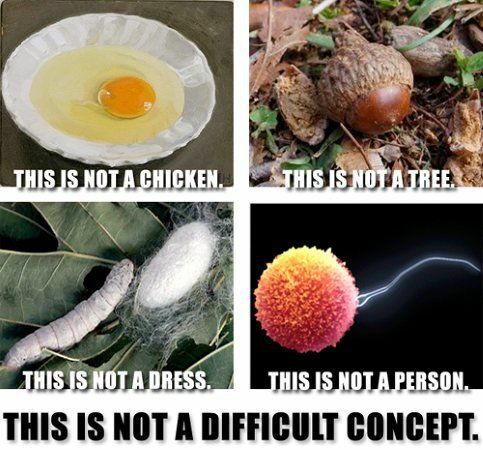 It would have worked even if they showed a fetus in its first stages of development. I don't call it a human until it could live on its own without being a biological parasite inside its mother. That isn't to say I expect it to be able to find its own food. Rather, all its major bodily functions should work and be able to keep itself alive. Even then, a baby doesn't have sapience. Yes, but eating a chicken, cutting a tree and burning a dress aren't crimes. Or at least eating a chicken and cutting trees weren't crimes when I was young!